1. 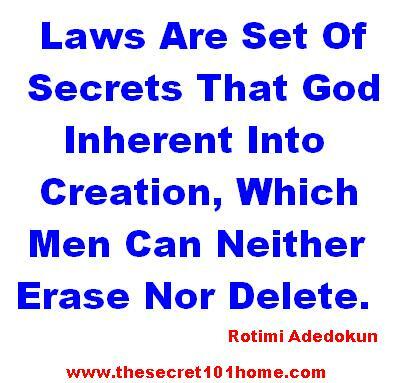 Laws Are Set Of Secrets That God Inherent Into Creation, Which Men Can Neither Erase Nor Delete. Rules A Set Of Agreed Or Conclude Thoughts Of Men Put Together To Governor Others. Laws Make Life Predictable But Rules Confuse Is A Limitation To Life. 2. The Law Of Vision: The Law Of Vision States That Only Those That Can See The World To Come, Live In The World To Come And Change The Present World Will Lead In This World. Vision Simply Mean Inviting The God’s Intention On The Earth. Everything Is A Vision And Vision Birth Change. You Don’t Need Job All You Need Vision. When Your Vision Is Sustain You Will Create Job For Others. 3. The Law Of Words: The Law Of Word States That Everything Is Made By Words, Everything Happens By Words And Without The Words Nothing Can Be Done. Only Those That Believe The Word, Confess The Word, Know The Word, Live The Word And Speak The Word Will Attract The Undeniable Result Of Life. Words Are God’s Like. No Word No World. 4. The Law Of Marriage: The Law Of Marriage States That Husband Love Your Wife And Wife Submit To Your Own Husband. Husband Leads And Wife Follows, Once There Is Switch In Roles, There Is Going To Be Invitation To Frustration Unlimited. If You Can Make Your Marriage Work, Your Live Will Produce At The Maximum Level. 5. The Law Of Money: The Law Of Money States That Money Has Wings And Has The Capacity To Fly Away If They Is Not Unwind. Also Expensive Grows As The Income Grows. Therefore, If You Want Your Money To Stays With You. You Have To Follow 70 and 30 Rules Of Money. 70 Percent To Spend And 30 Percent To Save. 6. The Laws Of Spirituality: The Law Of States That The Physical Is Control By The Spiritual. So If You Want The Best Of What You Can See You Have To Create Relationship With What You Cannot See. Spirituality Is The Building Of Good Relationship With The Invisible God That Owns And Control Everything On In The World. 7. The Law Of Success States That Anyone That Want To Be Successful MUST Break The Rules Of Men And Obey The Laws Of God. The Reason Is Simple, Men Set Rules To Limit Your Performance And Shutdown Your Intention, But God Gives Laws For You To Obey In Other To Get The Best Of Life. 8. The Law Of Sacrifice: The Law Of Sacrifice States That The Extra You Do More Than Other Is What Makes You Extra-Ordinary. If You Do What Others As Done You Will End Up Like Others. But If You Do More Than Others You Will Get More. The Difference Between 101 and 100 Is 1, One Is The Sacrifice. Only Those That Can Give It Will End As Champion. There Is Nothing That You Make Outstanding Mark In Without Making Outstanding Investment. 9. The Law Of Winning: The Law Of Winning States That You Can Win If You Are Ready And You Can Lose If You Are Not Ready. Winning Is Nothing But The Capability To Know What You Want, Plan For It And Invest In Yourself To Get It. Winning Is The Display Of What You Can Do Better, Faster And Cheaper Than Others. 10. The Law Of Responsibility: The Law Of Responsibility States That Nothing Is Done Except Someone Get To Work And Nothing Happen Except Someone Happens. Life Says What You Do Is What You Get. Life Will Not Give You More Than What You Can Do. It Is Called Input Equals Output. There Is No Over Night Success, If You Found One That Mean Someone Stand Overnight To Make It Happen. 11. The Law Of Protection: The Law Of Protection States That Whatever You Don’t Secure Will Be Stolen. The Only Mission Of Your Enemy Is To Steal Your Vision, Replace Your Purpose Mere Existence And Take Your Crown Away And Make Sure You End In The Crowd. Remember, Be Sober, Be Vigilant; Because Your Adversary The Devil Walks About Like A Roaring Lion, Seeking Whom He May Devour. 12. The Law Of Blessing: The Law Of Blessing States That You Are Not Blessed Because You Are Rich, But You Are Rich Because You Are Blessed. There Is Only One Secret To Be Blessed And It Is Called Giving. There Are Two Types Of Giving. Give Up To Be Blessed And You Give Down Not To Be In Need. Think Laws Think Highway To Success. This entry was posted in Life and Time Management, Self Development, Spirituality, The Peace, The Secret, Vitamin Of The Mind and tagged Bishop David Oyedepo On Laws, Jim Rohn On Laws, Pastor E A Adeboye On The Laws Of Life, Rotimi Adedokun On The Laws Of Life, Success101, The Law, The Laws Of Life, The Laws Of Success. Bookmark the permalink.